A nice outing is a trip to Chiang Dao Caves which are situated approx 70 kms north of Chiang Mai on a good roads through scenic rolling hillsides. The Caves are one of the main attractions in the Chiang Dao National Park. (There is an interesting mountain top temple nearby worth checking out). From Chiang Mai the trip takes about one and a quarter hours by car and as you approach closer you will see the scenic Doi Chiang Dao mountain range. The facility is associated with a temple. 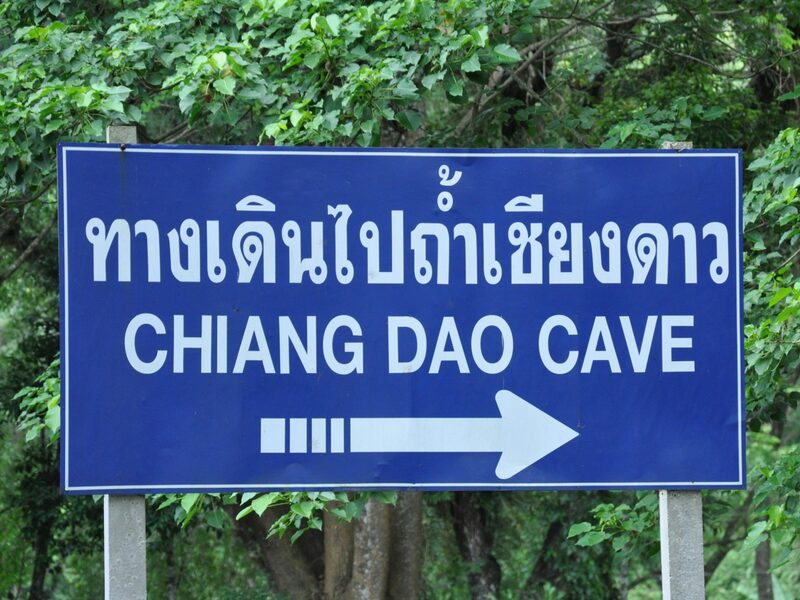 The Chiang Dao Caves complex itself is supposed to consist of over 100 caves which extend for some 10-12 kilometers inside the mountain range but there are only five main caves which are currently open to the public. You can freely explore two caves by yourself as they are lit with electric lights; they are Tham Seua Dao (540 m) and Tham Phra Nawn (360 m). Both of these caves contain many shrines, statues and Buddha images. To explore the other three, Tham Maa (7365m), Tham Naam (660m) and Tham Kaew (477m) you can either hire a gas lantern and do it yourself or hire one of the local guides with a lantern. Highly recommend the latter and an “up to you” cost for the guide. Easily worth at least an extra 100 THB but, “up to you”. If you go it alone be very careful as you can get easily lost and there are some very deep unmarked holes, plus you will miss most of the highlights. The guides will easily navigate you around safely at your own pace and point out all the sights and avoid the pitfalls. It is not all walking, in places you have to duck down to crawl through small openings and then clamber into large caverns. Some areas have little walkways others just natural rock flooring, others have up and down steps cut into the rock itself. It can get hot and humid inside as well. These are numerous natural formations of limestone and crystal that you will see, along with stalactites and stalagmites. If you go during the rainy season some areas near the underground river might contain water. Other times the floor in those areas is just all sandy. Check out the water level marks on the walls to see how high up it can get. We took Ace’s family to Chiang Dao for a day trip and it was well worth a visit, some truly interesting sights and remember, NEVER remove anything from the Chiang Dao Caves.